I love the front porch. I’d be sitting right here in this rocking chair right now if I could! They didn’t use any drywall in the cabin. Most of it was built with 8″ x 12″ white pine logs from Idaho. You can learn more about Jack Hanna and what he’s up to on his website. Read more about the cabin and see the rest of the photos by Heidi Long in the article by Jessica Bizik at Log Cabin Living. Harrison Ford and Calista Flockhart's New House in L.A.
Love it! This is exactly the size and type of home my husband I want to put on our property. I wish there was a picture of the bedroom. I love log cabins but my friend owns one and she says “never again.” I guess there’s so much continual maintenance involved and it’s quite expensive. Oh, really? That’s interesting! Didn’t know they were higher maintenance. Wonder why? I tried both links and got a warning about severe malware on both. That’s scary. I didn’t have any problems with them when I was working on this post. Just checked again and McAfee is giving me the “all-clear” sign. They don’t even have any outside ads on it that I can see. Strange! But–I should add–if you’re getting the warnings, don’t try it! My husband points out that you could be getting different things from it than I am. The best thing I’m sure about this house is how it smells. Don’t think I better show this to my husband. It is his dream to move to the mountains in Montana ever since he took a motorcycle trip there. He might just put a for sale sign in the front yard if he sees this…lol. Well, isn’t that the perfect little log cabin in the woods?! Darling and well-dressed for photos. Love the lighting in the bathroom! There’s my dream! 🙂 LOVE it! That’s a love nest! I love it. So romantic! I would like to crawl into that bath tub. right. now. We rented a cabin in the Sierras last summer and had a great time…though that lovely bathtub would have been a nice bonus! What a perfect cabin in the woods. Just think about what this place looks like when it’s snows. I bet it’s beautiful. If I had a cabin and scenery like this, I would spend lots of time here. My dream is to have a cabin in McCall Idaho and if I did, this would be the kind of cabin I would build. It’s just adorable. Love the slate sink. It would be a nice place to snuggle in for the winter. Maintenance could be dusting the tops of every one of those horizontal bars on the walls!!! I love this cabin but a bit too dark for me. I love that house. I’d better, because it looks an awful lot like my house, which is an old stone and log cabin with a creek running through the property and under the house. I do love this house and it’s picture perfect setting, but the irony is that my life-long dream has been to live in a rambling old Victorian. Gotta admit it’s a wonderful place to raise a family. County your blessings and move on, eh? Question: can anyone figure out what’s going on with that stuff going around the fireplace. I’m puzzled. What a fantastic place! I’m ready to move in! oh my gosh!!!! i love this!!! i think this just made the list for my dream cabin! oh man i can’t stop looking at that first picture. Does anyone know about one they might own on/in the side of a mountain somewhere? It seems to me I saw a show done on it once, and it was stunning, but can’t find any whisper of it anywhere. I’m sure it was Hanna’s – or thought it was. I’m beginning to wonder if I dreamed the whole thing. Jack Hanna lives in Flathead Lake near my dad and I’s old house. His big house on the lake is far more stunning than this one and what’s cool for me to know is that this house is around the big house as well. As a kid I would walk past this house always wondering who lived there b/c it was sooooo perfect! I knew he was my neighbor at the time, I just didn’t know he owned 2 houses on the street I lived on. wow! love how simple everything is inside…just like the industrial revolution never happened! Jack Hannah is right behind Jane Goodall on my ” I want to be this person! !” list. Now that I see Jack’s house…he might have trumped sweet Jane! I’m an Idahoan and have stayed in my share of cabins but this one looks like it doesn’t have loose chinking and might be air tight. I would be completely content to live in a place like that. wow. I was LUCKY to be this guys neighbor! How fun that you were his neighbor, Jaclyn! Sounds like an amazing property he has there. 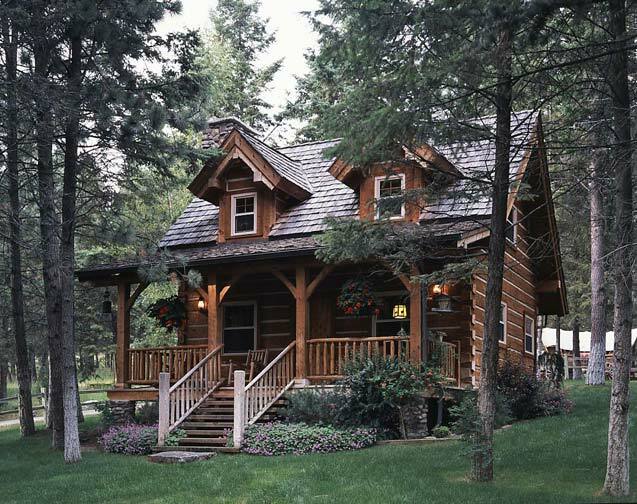 I meant to say, he has another house down the road from this cabin that’s like 4 stories and on Flathead Lake. We have a bit bigger cabin in the Blue Ridge Mountains of NC (2 bedrooms, 2 1/2 baths) with similar square hand-hewn logs and dovetail corners and front porch (we have a laurel railing from shrubs on the property cleared for the house). We absolutely love it and hope to retire there ere long. As for maintenance, you do have to re-seal the logs every 5 – 7 years and check the caulking, but you’d have the same thing if you had a wood sided house that you’d have to paint (actually less, no scraping old paint off). With a smallish cabin, it’s not that big of a deal, but I can imagine some of those huge lodge style homes would be a maintenance nightmare. There’s nothing like the warmth and solidity the logs and beams give, and the pine smell is wonderful (ours hasn’t worn off in nearly 8 years). I love the kitchen sink and bathtub shown here. Definitely going in my design file. Thanks for including a log cabin. Wow! He has great taste. My dream home to perfection! How were you able to use the pictures without copyright infringement? I’m asking because I’d like to find out how I can post them on my site, too. Any help would be so greatly appreciated! Hi Vince! On the Internet, the accepted rule is that if you use another site’s photos, you always give them credit back with a mention and a link. (And I never use all of their photos–I send people over to see the rest.) If they are personal photos someone has taken on a blog or something, I always ask permission first. It’s also good to give credit to the photographer if you know who he/she is. Hope that helps! It does and thank you so much. I had fun browsing your blog today! Since you made my day with this article, I wanted to share something with you. I did a little checking on the photographer. Her name is Heidi Long and her work is stunning! Here’s a link to her, and, I believe, her husband’s, photography website called Longview’s Studios. https://www.longviews.com/#mi=2&pt=0&pi=3&s=0&p=-1&a=0&at=0 At the top, just click on HEIDI’S PORTFOLIO. Then click on ARCHITECTURE and ARCHITECTURE TOO to see some stunning photography of more log homes. Oh, wow, her portfolio is gorgeous. Thanks for the link, Vince! You’re welcome. I’m a bit of a house enthusiast myself. I love log homes, cottages, Victorians, older homes like “The Waltons” (with huge porches), and unique looking homes. The type that, if you were fortunate enough to see the inside of, would have lots of nooks and crannies, arches, slanted ceilings and uniquely shaped spaces. Like I said, I’m starting a simple blog (not about houses) and I’ll be taking my own photos. Since some of those photos will be of houses, I’d be happy to send them to you. Even if you just look at them and delete them. If you would like to use them for anything, I’m fine with that, too. I ask for nothing in return. I just love running into other house enthusiasts! Have a wonderful 4th of July! Does anyone happen to know the dimensions of this cabin?